Striking Cocoa Beach Florida is a great place for your beach wedding, or next corporate event. Imagine walks along the beach, great food, and Soca, or Calypso music to top your night off. After all when your thinking about beaches you would surely be interested in listening to the best Caribbean music on the beach. With over 20 years of experience the steel drum players of RythmTrail can provide the music for you. Whether you want it to be a single player or the whole steel drum band they are the best out there. They play not just for the Cocoa Beach Florida area but the whole state of Florida. If you are on Merritt Island, Cape Canaveral, or even Palm Shores they are the best steel drum band for you. If making plans for a corporate event and you want entertainment that will be the talk of the year booking RythmTrail is the way to go. Steel drum band music can relax, romance, or even get the event moving. They allow you to design your own list, or you have the option to let them pick depending on the event or the events mood at the time. Great for all events national and international as well. In determining how to get your event going right, how to have a spectacular beach wedding, or even a corporate event keep in mind that amazing Caribbean music can improve any mood. Whether your at the Cresent Beach, or even Cocoa Beach Pier you can have an event to remember. 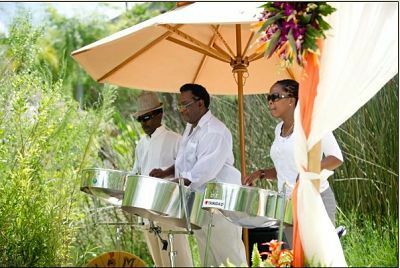 For your next corporate event, beach wedding, or even a great house party the RythmTrail Steel Drum Band is simply a click away. If you want to talk to someone about your even simply call (866) 495-4522 for booking or get a free quote online. Today Mar 19 2016 we will be playing a beach wedding and reception in Cocoa Beach FL. Ceremony on the beach then reception at Mango Tree restaurant.